Canelo Alvarez defeats James Kirkland with, possibly, the Knockout of the Year, on Saturday night at Minute Maid Park in Houston, Texas. Alvarez delivered a lethal overhand right to Kirkland, knocking the Texan out cold in the third round. Kirkland started the fight strong, immediately going for the attack and forcing Alvarez into the ropes. Alvarez began fighting back, with a strong left hook and uppcercut. Kirkland was hit badly with body shots delivered by Alvarez, and was knocked down. Kirkland’s corner told the fighter to “keep his hands up” and to work on his feet. In Round 2, Alvarez continued the assault by attacking the head and body. 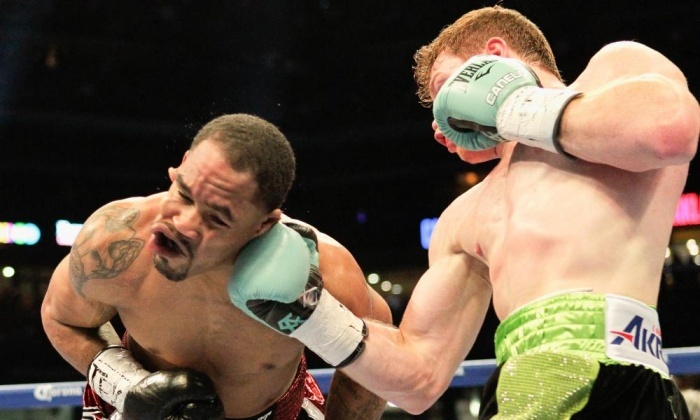 The Guadalajara-born boxer landed shot after shot and pushed Kirkland against the ropes. Kirkland, showing great heart, did what he could to stay afloat. Kirkland had Alvarez against the ropes again and threw combinations. Alvarez retaliated and landed strong body shots, which affected Kirkland tremendously. Round 3 began with Kirkland cornering Alvarez against the ropes once again. This didn’t last long, as Alvarez pulled himself out and continued to deliver impressive shots. Alvarez threw a strong right, sending Kirkland to the ground in a knockdown. Finally, Alvarez fired a deadly overhand right, knocking out Kirkland in the third round. Alvarez showed great sportsmanship after the KO, by not celebrating and stood by his opponent’s side to ensure his wellbeing. Alvarez landed 87/150 of total punches thrown while Kirkland 42/197. Alvarez’s record now stands as 45-1-1. A Miguel Cotto vs. Canelo Alvarez matchup is expected this fall, after Cotto’s fight against Daniel Geale on June 6th of this year.